which has filed thousands of small-claim lawsuits in Volusia County against insurance companies. Small claims lawsuits are typically, well, pretty small stuff. Disputes can involve claims over a few hundred dollars, sometimes even less. In 2016, such cases accounted for just under 4,500 case filings in Volusia County. But something strange happened in 2017. The number of small claims cases more than doubled, to over 12,000. And a single local law firm accounted for all of that increase — and then some — by filing 8,400 cases that year. It’s part of a statewide trend that is holding through the first half of 2018, and its effects are being felt not just in Volusia but in Flagler County as well, where the clerk of court’s office struggles to keep up with the greater workload. And it’s not just overworked clerks who are affected. Some of these cases may be costing you and every Florida motorist when you renew your auto insurance. Suddenly, small claim cases don’t seem so small-time anymore. The spike in cases is part of what insurance industry experts say is a move by some lawyers to make a high-volume business out of filing claims involving motorists in personal injury protection — or PIP — cases that help pay for medical care after accidents. Under Florida law, attorneys can make thousands of dollars in fees in cases involving disputes over mere hundreds of dollars. In one local case, lawyers were awarded about $40,000 after winning $790 for their clients. In most of the high-volume cases, the attorneys aren’t even working on behalf of the injured party. Through a practice known as “assignment of benefits,” the accident victim signs over any claim to repayment to the medical provider. The law also provides for something called “one-way attorney’s fees.” That means if the insurance company loses the lawsuit or settles for terms unfavorable to it, it must pay the medical provider’s attorney’s fees. But if the medical provider loses, it doesn’t have to pay the insurance company’s legal bills. The combination of assignment of benefits and one-way attorney’s fees is prompting some law firms across the state to cash in by suing insurance companies over relatively small amounts that medical providers claim they are owed, said Michael Carlson, president of the Personal Insurance Federation of Florida, an industry group that represents State Farm, Progressive, Allstate and Farmers. Across Florida, PIP lawsuits shot up nearly 50 percent to a record high of more than 60,000 in 2017, according to data from the Florida Justice Reform Institute, a group that says it fights against wasteful litigation. “The point behind the litigation is to get big attorney’s fees fighting over low dollar amounts. Unfortunately for your typical consumer of insurance, it means higher insurance premiums because of endless litigation,” said William Large, president of the Florida Justice Reform Institute. Simoes and David Davila — is relatively young. The Florida Department of State website shows the offices were formed between February 2017 and April 2018. 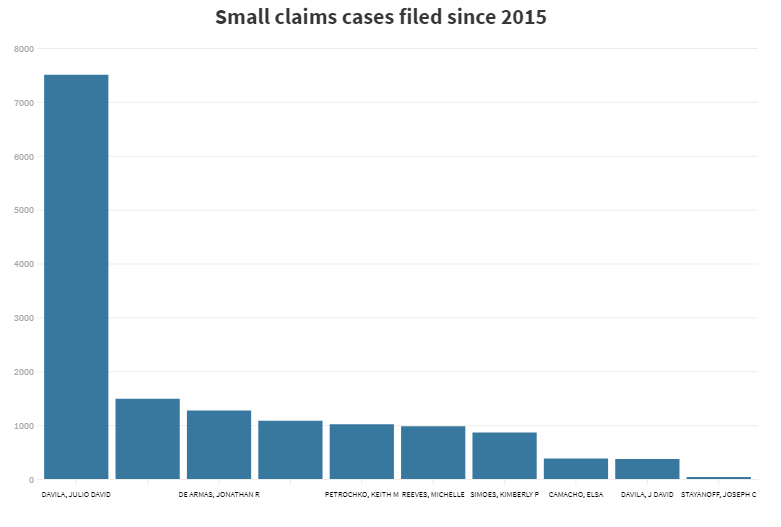 After lawyers with the firm filed 257 small claims cases in Volusia County in 2016, they filed 8,404 the following year. Through August of this year, the firm was responsible for 3,497 Volusia cases, 56 percent of all the small claims cases filed in the county. 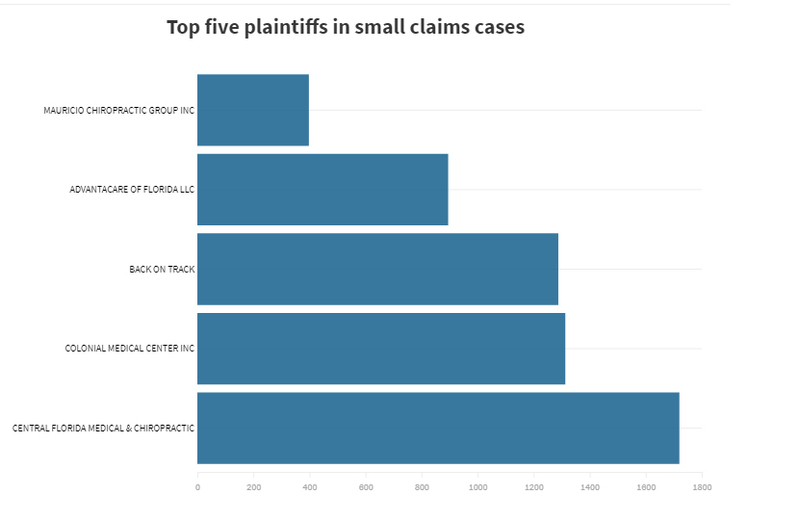 And many of the lawsuits appear to be for plaintiffs outside of Volusia County, like the 1,288 lawsuits from Back on Track, which does business as Florida Accident and Injury Center in Bradenton, which now goes by the name of Manasota Accident and Injury Center. When reached by the News-Journal, Thomas Hynds Jr., the registered agent on corporate records for Back on Track, referred questions to Simoes and Davila. When a reporter persisted in seeking information, he hung up. Simoes and Davila did not respond to repeated attempts to seek comment for this story. When asked before a hearing in DeLand why so many lawsuits were filed in Volusia County, one of their attorneys said, “That’s where our office is.” He declined further comment. with the spike in lawsuits which insurance experts say is part of statewide trend that could lead to higher premiums. 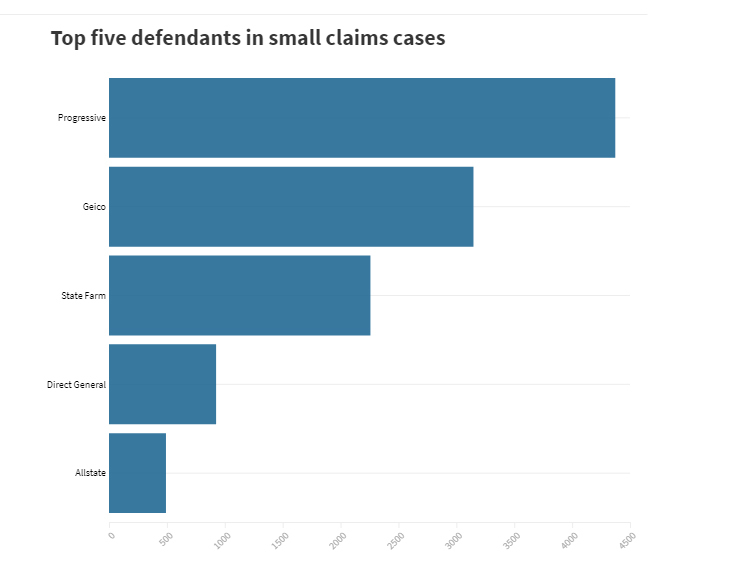 Small claims cases broken down by attorneys who work for Simoes and Davila, or have in the past. While it might be easy to blame the lawyers for clogging the system or exploiting a loophole in the law, they aren’t the only players. As other lawyers point out, you can’t forget the insurance companies. Brooke Boltz, a Seminole County attorney who used to represent an insurance company before switching sides to begin suing them, said there wouldn’t be so many cases if insurance companies paid out claims when they’re supposed to. Boltz worked briefly for Simoes and Davila. And the insurance industry has been in no hurry to seek reforms, objecting to efforts in the Florida Legislature to scrap the PIP system while it continues to jack up rates. And while insurers have cried long and loud over the assignment of benefits when it comes to property insurance claims, there hasn’t been a similar push from the industry when it comes to PIP, even though it’s responsible for far more lawsuits. As a consequence, the Florida Legislature has failed to reach agreement on how to reform PIP laws or attorney’s fees, leaving consumers on the hook for higher insurance premiums. Personal injury protection, or PIP, provides coverage of up to $10,000 under Florida’s no-fault insurance statute. 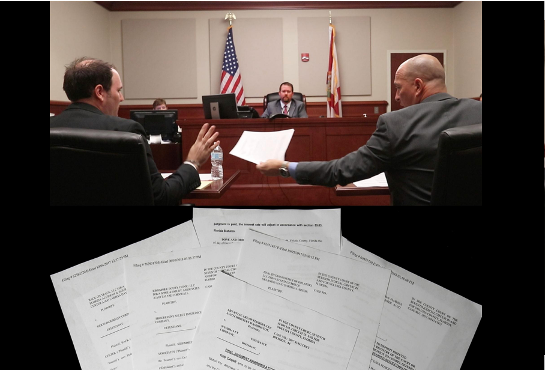 In response to increasing fraud — criminals working in conjunction with fake medical clinics took to staging accidents to milk the benefits — the Florida Legislature tried overhauling PIP in 2012. Reforms included giving accident victims 14 days to seek medical treatment and banning massage therapy and acupuncture as treatments for which they could file a claim. PIP claims decreased after the reforms, said Lynne Yeates McChristian, a communication consultant with the Insurance Information Institute. But they are now trending up again. At the end of the first quarter in 2018, the average PIP claim was $8,377. “The average cost of claim was bumping up against the maximum,” she said. State Rep. Erin Grall, R-Vero Beach, introduced a bill during the last legislative session to repeal Florida’s PIP statute, which the House overwhelmingly approved by a vote of 88-15. But the Senate’s version did not pass as lawmakers disagreed on how to replace PIP, according to news accounts. It was the second year in a row that the state Legislature tried and failed to tackle PIP. The House version would have replaced PIP with mandatory bodily-injury liability coverage at $25,000 per person and $50,000 an accident. The Senate also required drivers to buy $5,000 of coverage for the driver’s own injuries, even if the driver already had health insurance coverage. A State Farm lobbyist called it “PIP version 2.0,” and warned that costs to consumers would go up. One-way attorney’s fees were originally intended to give individual insurance holders, the little guys and gals with the actual policies, a fighting chance against powerful insurance companies that can afford platoons of lawyers. Some experts believe the benefit of one-way attorney’s fees should be limited to the original policyholder, saying a business like a pain clinic or chiropractor should not enjoy that advantage. 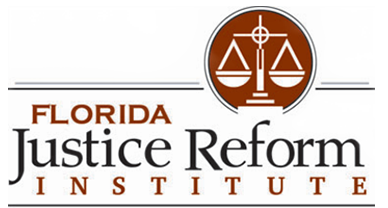 Combining one-way attorney’s fees with assignment of benefits creates too much incentive for lawsuits that are more about ginning up big fees than righting a wrong, said Large of the Florida Justice Reform Institute. The attorney’s fees can really ring up the cash register. In one example, Advantacare of Florida, represented by Kimberly Simoes, filed a lawsuit against State Farm saying the company had not paid it for services it rendered to Stephen Smith. Advantacare was awarded $789.62 according to court files. 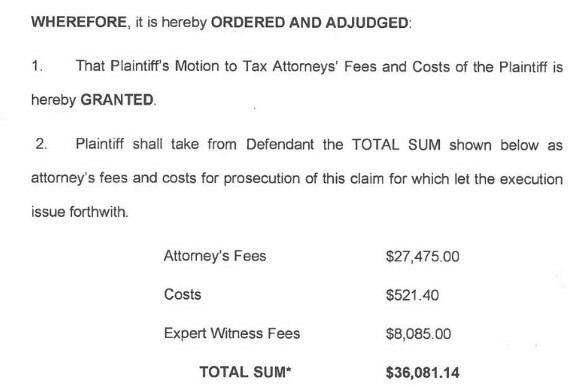 Simoes was awarded $39,985 in attorney’s fees. 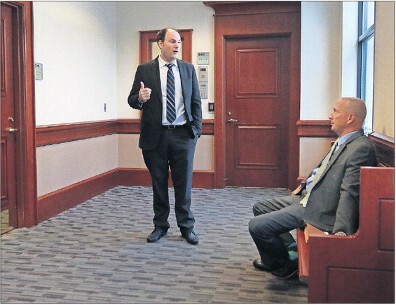 Attorney Mark Cederberg was awarded $3,500 for his expert testimony regarding whether Simoes’ fees were reasonable. About a month after the attorney’s fees were awarded, Advantacare dismissed the lawsuit. Another case involved Boltz. The PIP lawsuit by Advantacare of Florida in Daytona Beach against Windhaven Insurance Co. was for an amount not exceeding $5,000 for treating Christian Washington for his injuries in a traffic accident, according to the complaint. Boltz’s fees award: $22,995. Boltz lay the blame with the insurance company, noting that if it had paid the initial bill, there wouldn’t have been any attorney’s fees for her to collect. The $22,995 award is unusual, she said. In other cases, she won fees ranging from $3,000 to $5,000 with awards that ranged from $8,000 to $10,500. She added that while insurance companies may complain about the assignment of benefits clause, it helps doctors and other providers collect their fees. There are plenty of times an insurance company will refuse to pay anything on a $10,000 PIP claim, Boltz said. “Until I sue them, and until I did their deposition, and until I made it apparent to them they erroneously denied these bills, they weren’t going to pay,” Boltz said. Attorney Steven Robinson of Daytona Beach once defended insurance companies and has opposed Kimberly Simoes in court. He said a large increase in lawsuits probably means a lot of insurance companies aren’t paying. Until Florida lawmakers can get a handle on PIP insurance and attorney’s fees, industry insiders say they can expect two trends to continue: higher premiums for Florida consumers and the avalanche of lawsuits straining the resources at the clerk of courts’ offices. 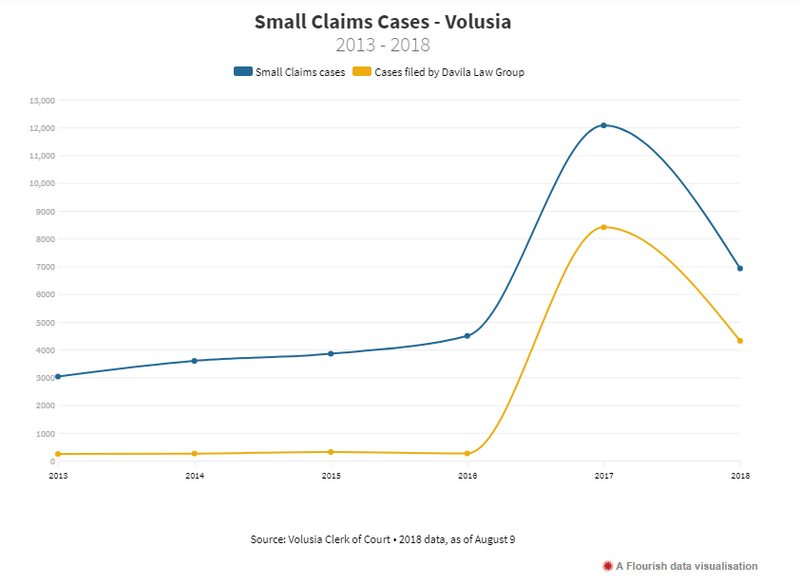 Volusia County Clerk of the Circuit Court Laura Roth said she’d never seen anything like the increase in small claims cases that started in 2017. “It is unusual. I’m not really aware of any other case type coming from one firm where we’ve seen such drastic numbers,” Roth said. 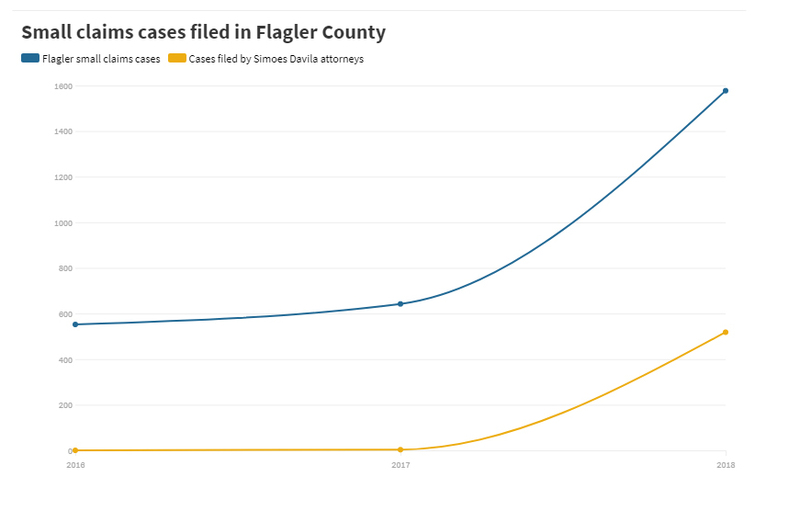 In Flagler County — which has seen 1,577 small claims cases so far this year, more than the previous two full years combined — the increase necessitated bringing in retired senior judges to help handle the caseload. One was set to preside over 153 pre-trial hearings for Simoes and Davila cases in a single day. Flagler County Clerk of Courts Tom Bexley said the spike is overwhelming to his two clerks who handle all the county civil cases in Flagler. on March 21, 2017 claiming Windhaven owed up to $5,000 in unpaid medical bills from a 2016 auto accident. expert witness on attorneys' fees. The grand total including the expert fee is $35,522.50.